Time is valuable and if you have got a meeting round the corner then you will certainly want it to be precise, to-the-point and timely. 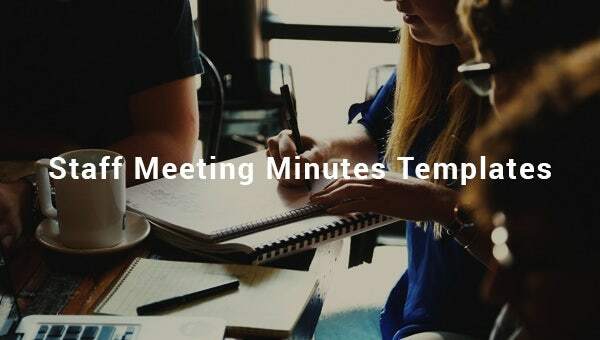 One of the best possible ways to materialize this is to use a Staff Free Meeting Minutes Template. 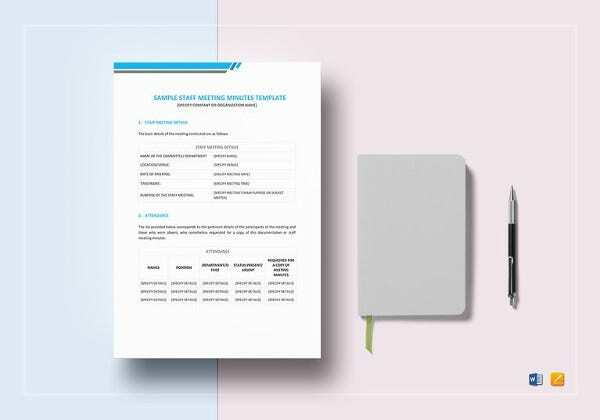 These are neatly defined documents that include details about attendees, subjects to be addressed and time slots allocated for different topics. The use of this template ensures the hitch-free materialization of staff meetings. 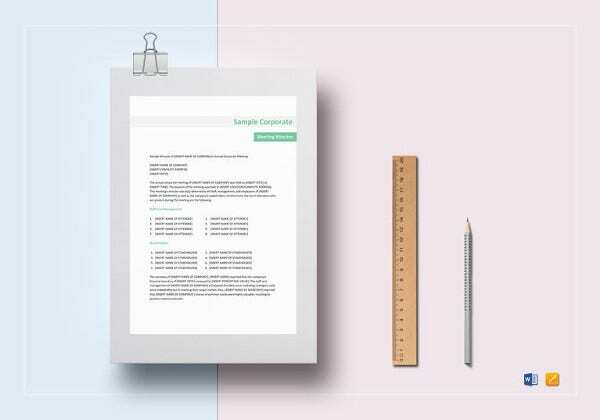 With this template, you can make sure every topic is touched upon with precision while keeping the duration in check. The best thing about these templates is their ready availability online in customizable formats. 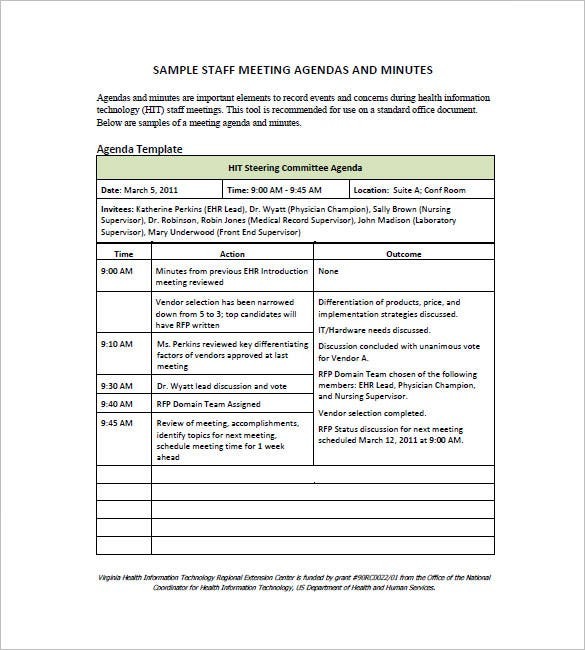 You may also see Meeting Minutes Templates. If you are looking forward to a weekly staff meeting and in no mood to miss out on its important aspects, then you should opt for a Weekly Staff Meeting Template without a second thought. It’s a standard document elegantly designed to suit your purpose. 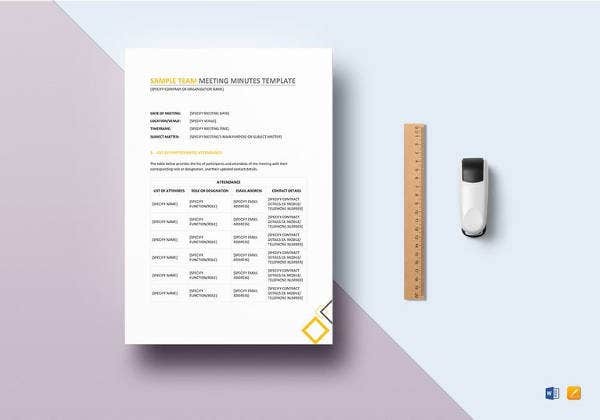 These templates include every minute detaillinked to the meeting and will not leave you guessing for anything. They also allow you to customize and use them according to your specific needs. You should invariably refer to these templates for quality results. 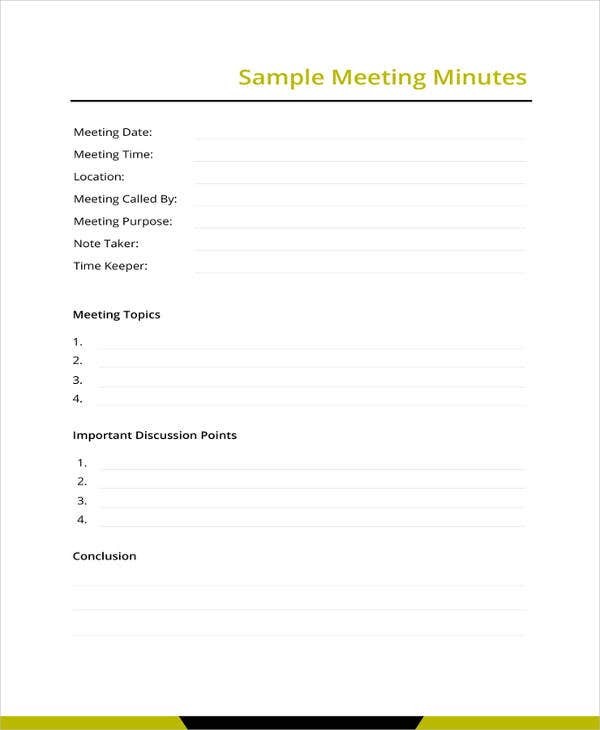 You may also see Best Meeting Minute Templates. Tired of trying to remember what problems need to be addressed and what decisions need to be taken? 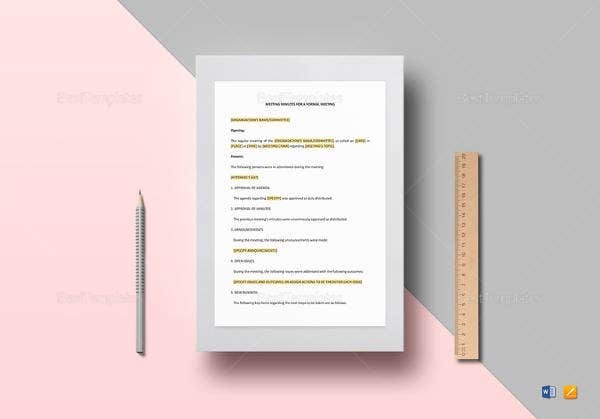 This collection of templates is full of tables and texts in order for you to classify the different aspects discussed. You may also like to take a look at our meeting minutes templates. They are available in different designs and layouts and you will be sure to find one suited to your needs. 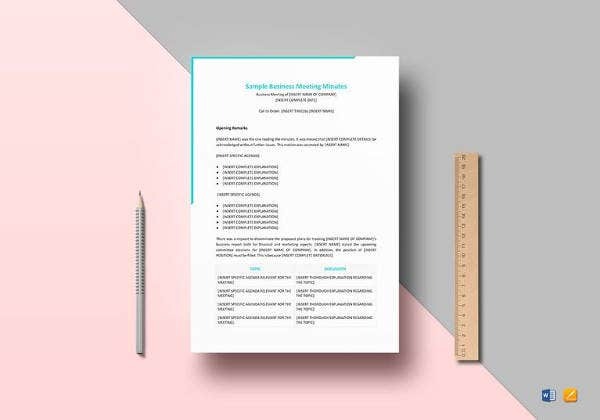 Sample Staff Meeting Minutes Template is a detailed template with all the required details being addressed. The objectives in neat pointers and the division of time, minutes and activity will leave nothing to guess. 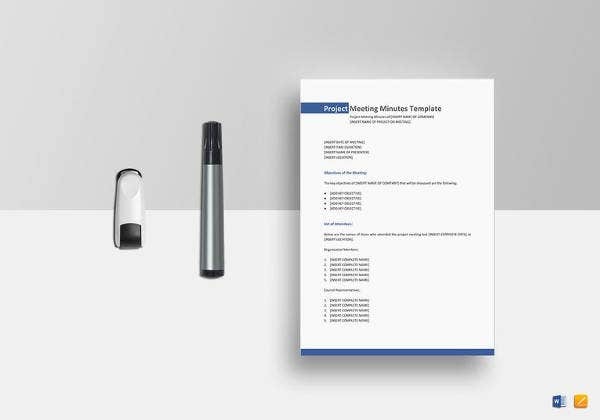 You may also see Corporate Meeting Minutes Templates. 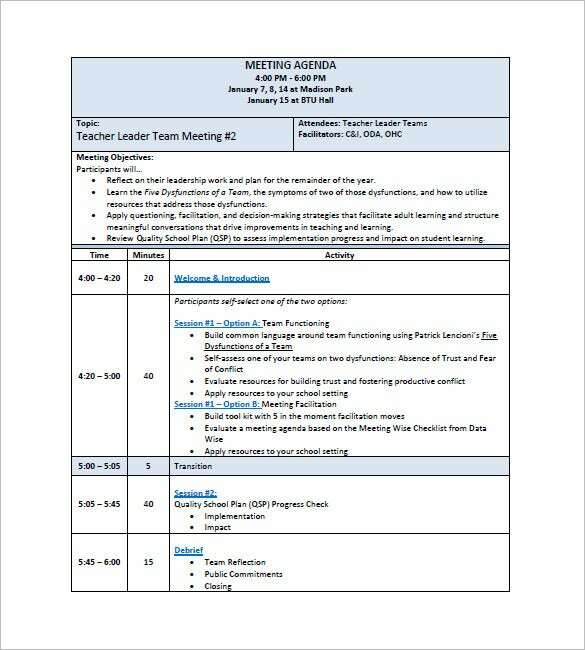 The best way to get prepared for a School staff meeting is to have a School Staff meeting template at your disposal. 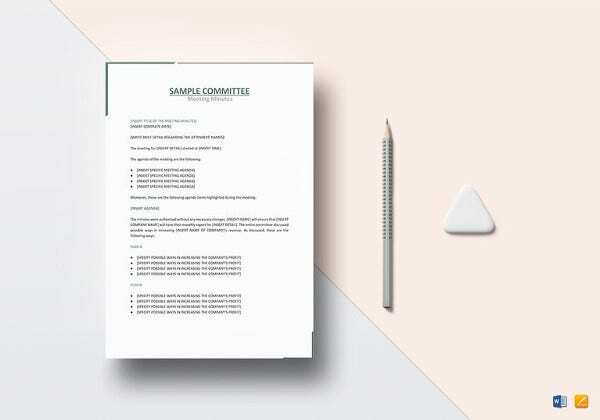 It is a simple document that includes details like location, time and other important specifications of a staff meeting. These templates have been designed keeping in mind the purpose of a staff meeting. So, you don’t run the risk of missing out on any important aspect of the meeting. These are easily available over the internet and you can grab one as per your requirements from the available choices. Owing tothe support itextends to school staff meetings, a School Staff Meeting Minutes Templatecan be considered a must-have. You may also see Business Minutes Templates. Staff Meeting Minutes Template Sample has the agenda details on the top and then the rest of the information is presented in a boxed layout. Download this format for a complete document. 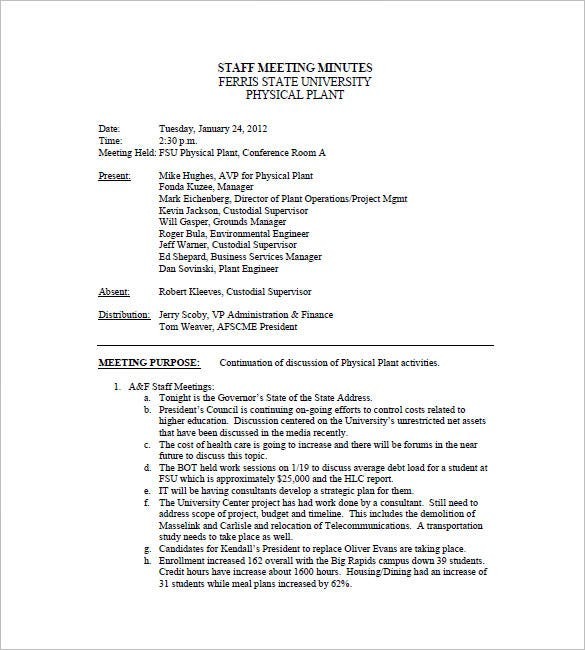 You may also see Team Meeting Minutes Template. 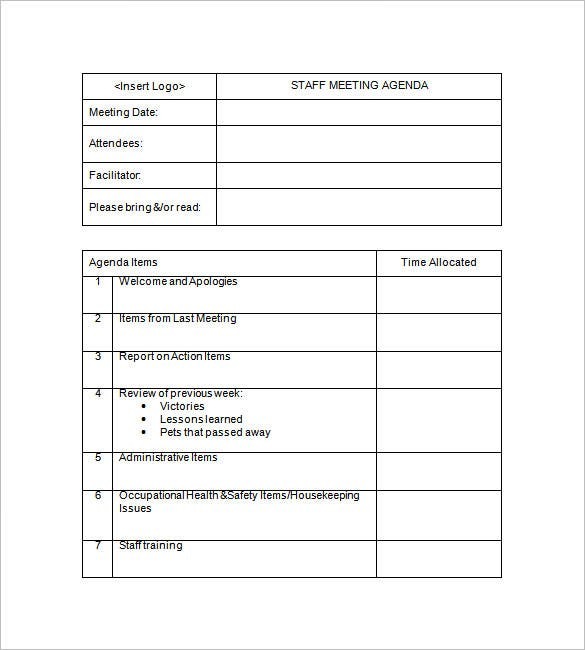 Staff Meeting Minutes Template Example is divided into two parts. The top half is just for the meeting details such as location, timing etc while the lower half addresses the meeting purpose. 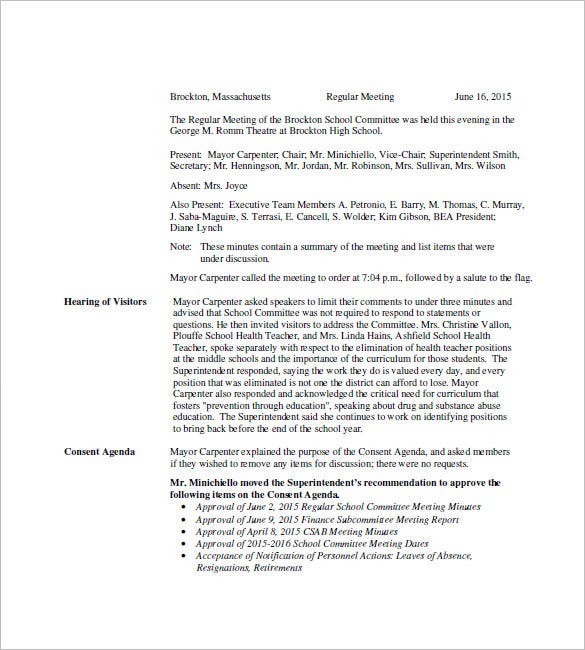 You may also see Board Minutes Templates. 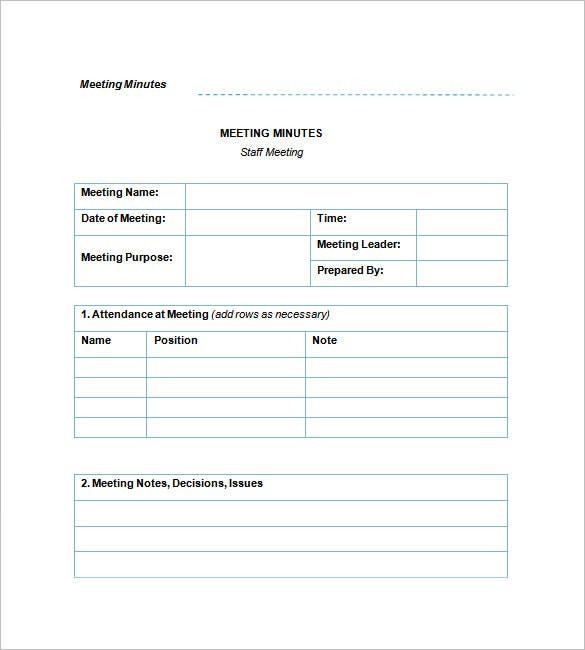 Sample Staff Meeting Minutes Free Download contains two boxes with date, attendees and facilitator details in one and the agenda items in the second one along with the allocated time. You may also see Free Meeting Minute Templates. A meeting involves a group of people that discusses on subjects of interest. The fact that staff meetings have become mundane over time makes it challenging for participants to develop interest in any of the discussed topics.Chaos and lack of order only add to staff meetings’ dying popularity. So, the need of the hour is to make them interesting by allowing them to progress according to its set agenda. 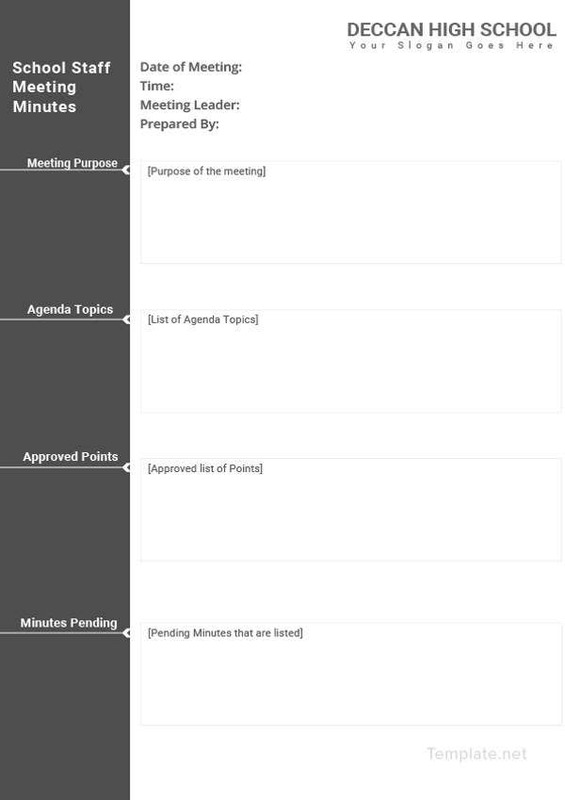 Making a staff meeting sticks to its agenda is possible only with a staff meeting minutes template. 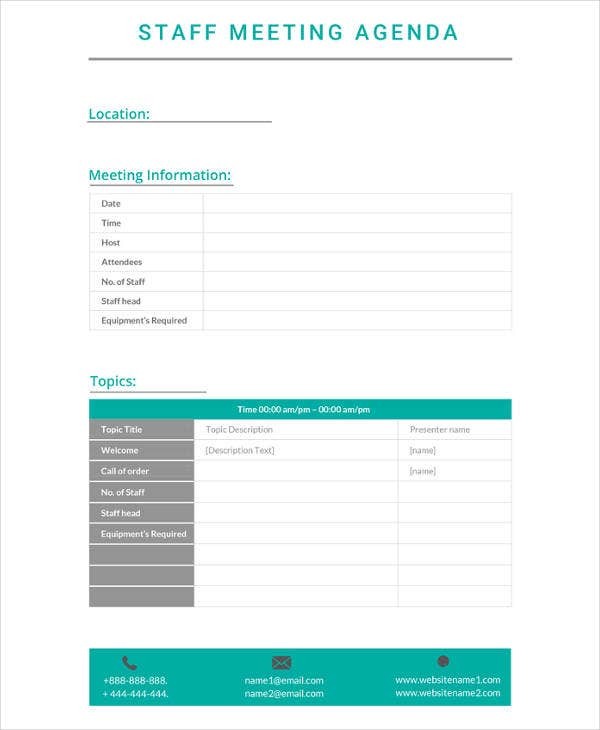 With a staff meeting template you can assign each and everyone a time slot to share their views. In short, these templates are a boon to organizations such as a school. 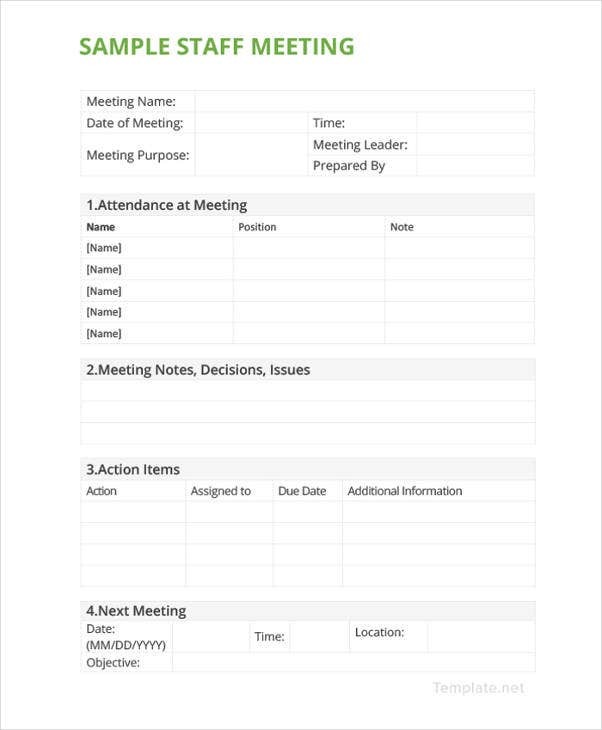 You may also see Professional Meeting Minutes Templates. Staff meeting template is essential for all kinds of staff meetings. You can choose to pay money for your download or search for options that offer free services. No matter which option you choose, you should look to getting quality templates only. They are absolutely easy-to-use and hence, can be used by anyone. 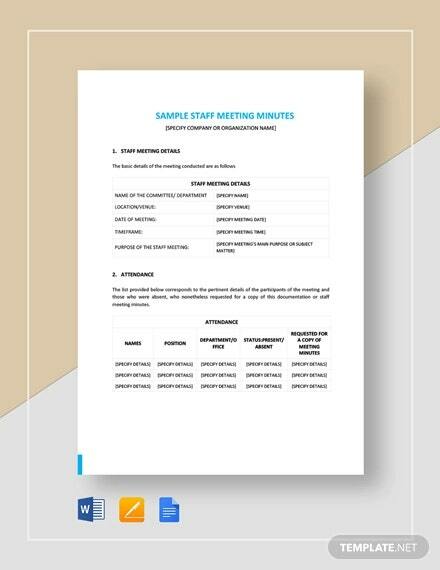 You may also check out here Minutes in a Meeting Format Templates.